Joyner Plumbing is your local water heating service expert! Call us when you are in need of water heater services! 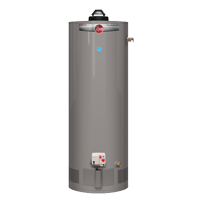 There are 2 different kinds of tank water heaters: Conventional high-efficiency gas water heaters and Electric water heaters. 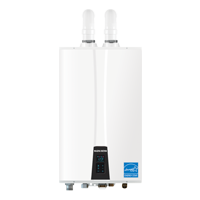 click the Rheem & RUUD logos above to learn more about the tankless water heaters we carry. To minimize standby losses you should consider water heaters that offer higher levels of tank insulations. Often the lowest-priced storage water heater may be the most expensive to operate and maintain over its lifetime. Due to the demand, a modern tank water heater can supply it will seem like there is an endless supply hot water - for bathing, cooking, dishes, laundry, and all the other countless ways hot water enriches our lives. We carry a wide variety of gas tank water heaters. They are often the lowest installed cost choice for replacing an existing system. Electric prices dropped in the '50s, making electric water heaters more appealing. Installation and initial cost was also cheaper than solar hot water heaters. Electric hot water heaters are also slow to recover when compared with gas water heaters. Nevertheless, upkeep of the electric water heater is easier as it involves very little maintenance. Call Joyner Plumbing today to get expert electric water heater services in Fort Worth.